Gord and I went to Toronto Oktoberfest this evening. 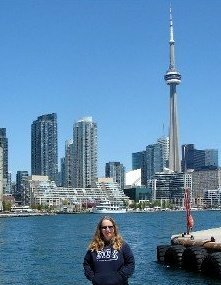 We went last year and the year before and had a fun fun time. 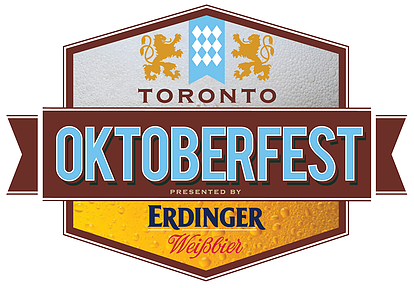 Join 5,000 others dressed in dirndls and lederhosen at Toronto's largest Oktoberfest, celebrating Bavarian heritage with food, beer, music, and a fun fair modelled after the original Munich event. This two day festival takes place in a massive Festhalle tent and outdoor Bavarian Village. It was held in a tent at Ontario Place (a different tent from last year). We got there just before it opened at 6pm. The first 500 attendees got a huge stein (we did ... yay!). They are a heavy glass stein this year (the last two years they were large and plastic). Drink tickets were $8.50 each. Two tickets filled the stein with beer (I just had a half stein). My pal, Larissa, and her friend, Andy, sat with us. It was set up differently than the last couple of years. The stage was to the side, rather than at end. Unless you had a reserved table (you had to reserve the whole table! ), you had to scramble for a spot at one of the eight tables or stand or sit outside ... we got there early enough to find seats at a table. In past years, there was plenty of non-reserved seating. The eight non-reserved tables where we were sitting were at the edges of the tent so it was impossible to see the stage or the dancers. The sound was distorted and sounded awful. There was a big crowd (it was sold out) and the noise level was loud and we had to yell to talk. At one point, Gord was brought on stage because of the teeshirt he was wearing and I had no idea. It wasn't like that in previous years. There were vendors selling Oktoberfest clothes, hats, etc. You could get your hair braided. There were less beer and food choices/vendors this year. The line-ups for beer and food were really really L-O-N-G. I couldn't resist buying (and sharing) a warm bag of nuts, though. The changes they made to this year's Oktoberfest didn't make it enjoyable and we left early. I'm not sure we'll be back next year.